Oh, the sweet, sweet freedom of having a Saturday off... I know my job isn't the hardest in the world, and there are plenty of other people who work far more hours than I do. But working 46 hours a week with very young children, with 1 day off a week, gets pretty exhausting. Monday to Friday is fine, but it's the Saturdays I'm most sick of, having to get up early to spend the morning in work doing very little. And while many of my friends have one off each month, I have none. So a public holiday on a Saturday, giving me my first 2 day weekend in months (holidays excluded)? Well, of course we were going to party. And with the rising temperatures and humidity, what better way to do it than on a boat? Firstly, we all have to thank Emma for the whole day, since she was the one who organised everything - goodness knows, the rest of us would never have gotten into gear to do so. It was particularly well done on her part, as a public holiday is an especially popular day to hire a boat, and we were in danger of not being able to find one. The traditional Chinese junk boats are the old-fashioned looking wooden ones, with the red sails, and make for a very pretty picture as they sail through Victoria Harbour. We didn't have one of these, instead getting a more modern boat with an engine (I suspect the traditional ones are ridiculously expensive), but we actually got a free upgrade from what we originally paid for, hooray! There were 25 of us onboard, and we set sail from Central just after 10am, for a full day out, returning at 6pm. And what a way to spend a Saturday it was. Everything about it was no relaxing and stress-free, as I very quickly forgot about all the tasks I need to do, all the annoyances I have at work, and anything else that could possibly lower my mood. Naturally, we all had some alcoholic aid in doing this, but just being out on the boat felt so much freer and calmer than say, a night out would have been. We got so lucky with the weather too, as it had forecast rain all week, but we had sunny skies pretty much all day - though I seem to be one of the only ones who managed to avoid sunburn! 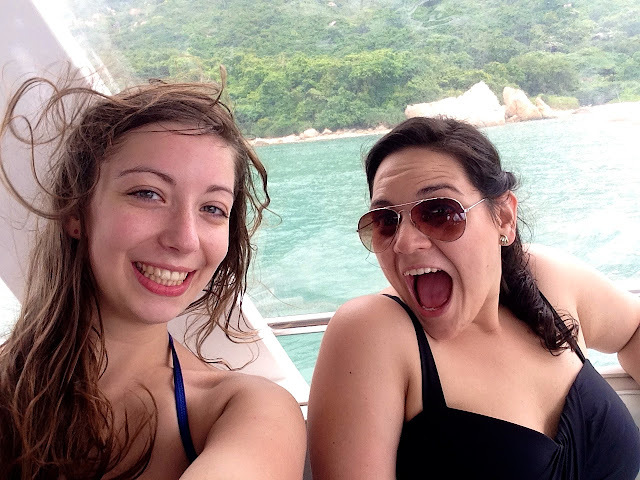 We talked, we laughed, we drank, we ate, we sunbathed, we swam, we danced - all while cruising the waters around frigging Hong Kong. Living the dream. I definitely had one of those how is this my life right now moments. We didn't spend the whole day on the go, instead only sailing the short stretch from the harbour towards Lamma Island, where we dropped anchor for most of the afternoon. It was near a secluded beach, that didn't seem to be accessible by land, and there were another 2 boats docked nearby. As soon as we stopped, half a dozen of our crew immediately plunged from the top deck into the waters below, whooping and laughing all the way, before climbing aboard and running upstairs to do it again - it's so nice to act like children, instead of taking care of them all the time! I wasn't jumping myself - serious fear of heights over here! - but did pop in for a swim. The boat's supply of rings and floating toys meant we could simply lie back and carry on drinking. Several of us did head to the beach though, which was a longer swim than I anticipated - I made it, but my arms and shoulders could certainly feel it the next day! The beach itself wasn't all that exciting, and of course we had no towels or any of the stuff you would normally take to a beach, since it was all back on board the boat. On route back to the boat, we lost several of the gang to one of the other boats - partly they wanted to socialise, but we also tasked them with stealing the captain's hat we could see, to give to Emma. That task was accomplished eventually (see below! ), but it actually took two of the guys from the other boat coming over to ours, with the hat, for Emma to actually get her hands on it. By this point, we were getting a little rowdier too, with some rather spectacular falling over, and a broken broom from when Sam decided to re-enact a scene from Harry Potter... it's safe to say the couple that owned the boat were not our biggest fans. They did seem used to it though, as I highly doubt we were the first drunk party they've had on board! We were having a fantastic time though! And to finish off the day, does it get much better than sailing back into Victoria Harbour, with that iconic skyline surrounding us? Sometimes I remind myself that I live halfway around the world in Hong Kong of all places. You get used to the city, and then all of a sudden you have a moment where you remember that this is your reality, this is your life, and think wow. How did this happen to me? 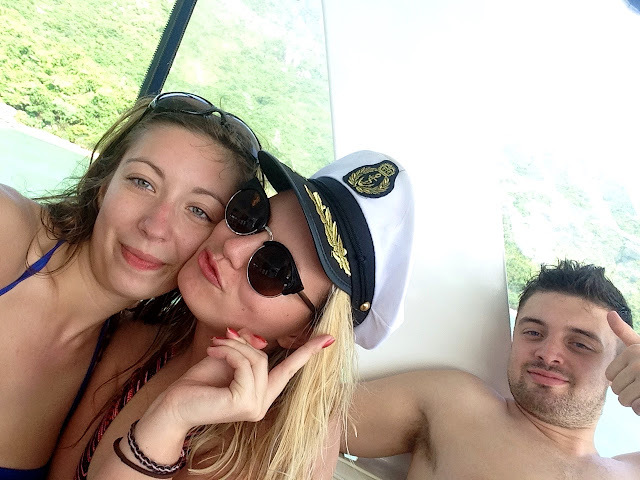 How did I get so lucky as to spend a day partying on a boat, swimming in the seas of Asia? Sure, my life isn't perfect, and there are plenty of things here that I complain about, both at work, and around the city. But days like this are so much fun, and so unique, and they remind me of why I am out here, why I decided to do this, to move halfway around the world. A fantastic day out, with a wonderful group of people, and ticking another "thing to do in Hong Kong" off my list - living the dream indeed.